The youngest ever Nobel Peace Prize winner brought her message of empowerment for women to Washington Sunday, calling for girls to start believing in their own potential as leaders. In the three years since she was shot by the Taliban for pursuing an education, Malala Yousafzai has traveled the world advocating for women’s empowerment. Yousafzai spoke about women’s rights and the education of girls at a gathering for Voice of America’s Deewa Service. She also stressed that her message ultimately has meaning for women – and for men. “If we deprive half of the population of the world and do not allow them to come forward, then it will be really for us to go forward and achieve success and see development for every country’s development. The full participation of both male and female is important,” Yousafzai said. In an interview after the gathering, Yousafzai told Voice of America that more women need to come forward to take part in every field, including politics. “I think that it’s important that we provide quality education to women and men – we also need men to give the space to women which they deserve. It’s collective work and I’m hopeful that with quality education and this change in mindset that we see this change and we see women taking the roles that they deserve,” she said. Speaking of her father, Yousafzai said: “He inspired me to speak up for my rights, he inspired, he did not force me, he did not push me so I have learned from him and the role I have taken is because of his inspiration." Yousafzai was joined at the gathering by parents and siblings. 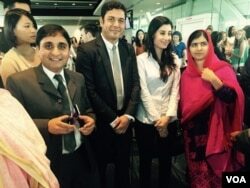 Malala’s father, Ziauddin Yousafzai, called the day of her shooting, “the hardest and worst day” of his daughter’s life. She continues to bring attention to her message with the release this October of He Named Me Malala, a documentary about her life. The title references her father’s decision to name her after a famous Pashtun heroine. Malala Yousafzai turned 18 in July and recently passed her college exams in Britain with excellent scores. She told the audience she would continue traveling around the world, advocating for women’s rights and looks forward to a time when she can return safely to her native Pakistan.